150 MHz beacon satellite COSMOS 2454 drifting through a stationary beam pointed at direction of closest approach. As we are slowly starting to get the system up and running, we are doing various passive measurements to ensure that the system is in fact working as we would expect it to. One of the passive tests that we are doing is measurements of beacon satellites that fly over KAIRA. More specifically, we are using beacon satellites that transmit 150/400 MHz frequency pairs. We are using these types of satellites already for recording relative electron density curves in another project. With KAIRA we can of course only listen to the 150 MHz band, but this already gives us a nice way of observing our beam patterns. 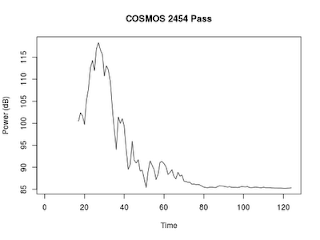 Here is result of the first such test, for a COSMOS 2454 that passed over with a peak elevation of 87.3 degrees. We used one beam to observe at the direction of the closest approach and recorded the signal power within a 200 kHz band. As expected, as the satellite passes the beam, we see the power fluctuating as it goes through the main and side lobes of our receiver beam. In the upcoming days we will be doing more such tests, comparing carefully the location of the satellite with the received signal power. 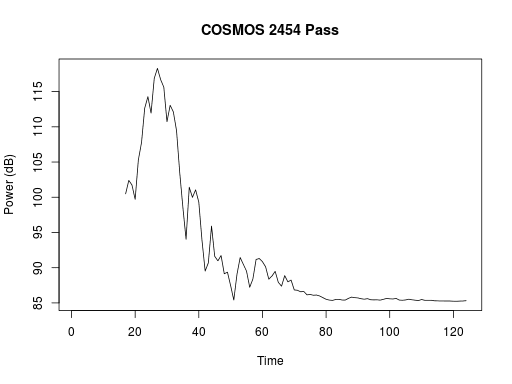 While the Astron group did a lot of tests that could be considered first light, this is the first light measurement with KAIRA for me.